From L to R: Chief Executive Will Hancock, South Central Ambulance Service, representing the Association of Ambulance Chief Executives (AACE); Roy Wilsher, Chair of the National Fire Chief’s Council (NFCC); and Commander Mak Chishty, Metropolitan Police, representing the National Police Chiefs’ Council (NPCC). 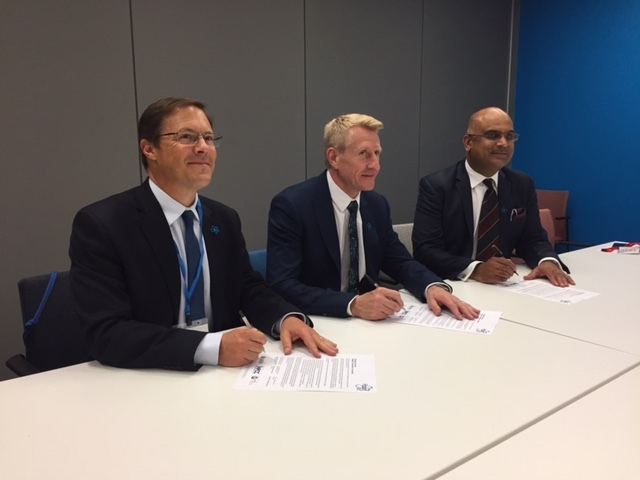 The National Fire Chiefs’ Council (NFCC), The National Police Chiefs’ Council (NPCC) and the Association of Ambulance Chief Executives (AACE) met with leading dementia charity Alzheimer’s Society on 18 May to sign a strategic commitment to work towards being dementia friendly organisations. The commitment from emergency services will help bring fire, police and ambulance services together to help support people living with dementia and those caring for people living with dementia in a more cohesive way. This will be done by: internally developing their people, places and processes; and externally ensuring a dementia friendly service is delivered to the community who come into contact with the emergency services. Following this commitment, all fire, police and ambulance chiefs across the UK will now be encouraged to come together and sign the commitment at a local level. Assistant Chief Fire Officer Sean Bone-Knell, Director of Operations at Kent Fire and Rescue and lead for public services leads the project on the Prime Minister’s Challenge group. This group, formed in 2012, is striving to increase the number of dementia friends and dementia friendly communities across the United Kingdom. Dementia is set to be the 21st Century’s biggest killer, with someone developing the condition every three minutes – but too many people affected struggling alone. During Dementia Awareness Week, Alzheimer’s Society asked people to come together to unite against dementia, forgetting their differences to help urgently find a cure, improve care, and offer help and understanding. The charity is a strong advocate of the role organisations have in building a more dementia friendly society, to avoid social isolation and enable people with dementia to live independently in their own communities as long as possible. Deputy Chief Constable Janette McCormick said, “Dementia touches the lives of millions of people across the UK, yet many people do not understand what the condition is, and what impact it has on those who live with it. Many people think that dementia is purely about memory loss and believe that there is nothing they can do to help, but that is simply not the case – it is much, much more than that and we can do something to make a difference. Assistant Chief Fire Officer Sean Bone-Knell, the Director Operations at Kent Fire and Rescue, said, “Emergency services can support people living with dementia to improve the safety of their homes and make their lives as comfortable as possible. This is also reassuring for people caring for family members or friends. Developing our staff to know more about dementia is vitally important to take every opportunity to assist in whatever situation we encounter. “Emergency services are also large employers and developing our staff to understand and how to care for people living with dementia is very important. Our support can be as simple as advice and guidance through to adapting or adjusting polices to give flexibility to staff caring for people in need. Will Hancock, Chief Executive of South Central Ambulance Service and national lead for this work on behalf of AACE, said, “Ambulance services across the country are committed to delivering in partnership with emergency and other services, the best possible care for those living with dementia. Supporting and caring for those with this debilitating and progressive condition needs a cohesive approach and signing up to this strategic commitment will pave the way for this to be implemented at a local level. Alzheimer’s Society, along with the NPCC, AACE, NFCC and Kent Fire and Rescue, is calling on everyone from across the emergency services sector to unite and take action. Unite now at alzheimers.org.uk and find out more about the Emergency Services Commitment here.